Dr. Allen, who was the founder and Program Director of the Kaiser Permanente Chemical Dependency Recovery Program at Vallejo, California for 20 years, and served for ten years as Kaiser’s Northern California Chair of Chiefs of Chemical Dependency Services, pointed out that I had neglected to acknowledge Dr. Vince Felitti who was really the inspiration for the early work that birthed the ACE Study. So, better late than never, I asked Steve to give me his up close and personal perspective on the roots of the ACE Study; and tell of his own experience with Dr. Felitti and the ACE studies at Kaiser. By so doing we can give Dr. Felitti his due recognition, respect and thanks for all he did to educate us about ACEs. “When I read David’s Tips and Topics for November, I was happy to see that he was addressing the Adverse Childhood Experiences work. However, I was surprised that he said Dr. Robert Anda was “there at the start,” and that Dr. Vince Felitti and his Kaiser work was not even mentioned. For those who may not be familiar with Kaiser Permanente, it is the largest prepaid, non-profit, healthcare delivery system in the United States, with the bulk of its services concentrated in California. Kaiser has always provided mental health and chemical dependency services alongside its other medical services. From 1989 until my retirement from Kaiser in 2010, I was privileged to be their Chemical Dependency Services Chair for Northern California. During that time, Dr.Felitti was a physician in Kaiser San Diego’s Department of Preventive Medicine. Which makes me “there at the start,” too, though I was not aware of it for some time. During the 1980s, in the San Diego Kaiser Weight Program, the physicians made the counter-intuitive observation that patients who were successfully losing weight were the most likely to drop out of treatment. Subsequent exploration with these patients revealed that the great majority of them had unrecognized problems dating back to childhood. Obesity with these people provided hidden benefits; it often was sexually, physically, or emotionally protective for them. This led to further exploration of Kaiser’s general medical patients, which revealed an unexpectedly high prevalence of adverse childhood experiences. It was at this point that Dr. Felitti invited Dr. Anda and his group at the Centers for Disease Control to design and analyze the series of large-scale studies which documented the prevalence and the astonishing health implications of these childhood experiences. Results for nicotine and injected drug dependence were quite similar, as well as those for chronic obstructive pulmonary disease (COPD), ischemic heart disease, asthma, depression, and other conditions– always a strong, graded increase in conditions as ACE scores increased. The original article on this study was published in 1998, but long before that, as soon as the results became clear, Dr. Felitti began visiting all of the Kaiser medical facilities to present his findings. This was how I had the opportunity to meet him and to be blown away by the information he was presenting. He returned a couple of more times after that, with more information and a stronger case. He was on a mission to make all of us at Kaiser attentive to this important connection in the patients we were seeing. 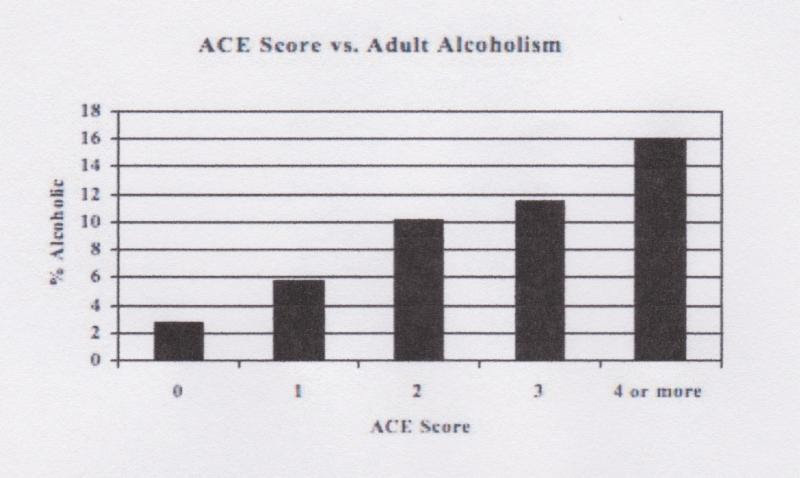 Most memorable to me was his presentation to all the Northern California Chemical Dependency staff on ACE and addictions, which convinced me to always use the ACE questions as part of our comprehensive assessments of addicted patients. A couple of weeks ago an article by Sammy Caiola, Health Reporter for my local Sacramento Bee (SacBee) newspaper caught my eye. The headline read: “Is the pen still mightier? The pros and cons of loose leaf vs. laptop“. In the October 2010 edition of Tips & Topics, I excerpted a Wall Street Journal article by Gwendolyn Bounds: “How Handwriting Trains the Brain Forming Letters Is Key to Learning, Memory, Ideas”. (The Wall Street Journal. October 5, 2010.) She articulated how writing by hand is more than just communication. It engages the brain in learning and has a unique relationship with the brain in composing thoughts and ideas. “Interactive Journaling (IJ) as a clinical tool combines elements of bibliotherapy (the presentation of therapeutic material) with structured reflective writing” (Miller, 2014). Interactive Journaling is on the Substance Abuse and Mental Health Services Administration’s National Registry of Evidence-based Programs and Practices (NREPP). In 2014, I wrote an article about Interactive Journaling ® (IJ) that explains how IJ finds the right balance of the structure of EBP with the central importance of the therapeutic alliance to enhance positive self-change. In the May 2014 edition of Tips & Topics, Interactive Journaling ® was the focus and how to use IJ in Impaired Driving classes, addiction treatment and mental health settings, as well as with criminal justice populations. 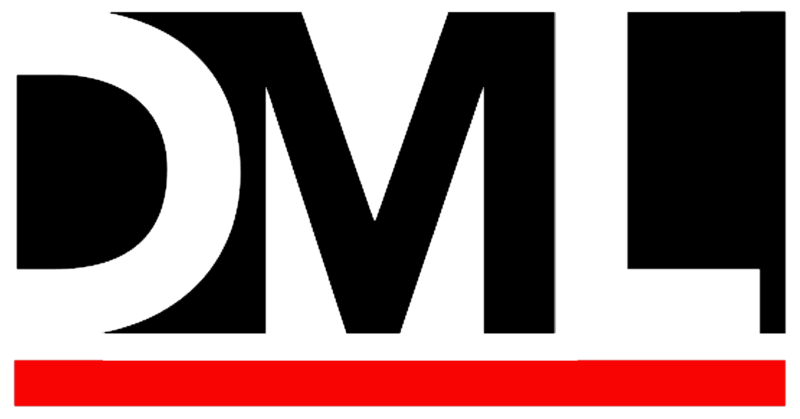 * The MEE Journal System – the practice of Interactive Journaling® is supportive of trauma informed care in many aspects, including IJ’s reinforcement of personal empowerment and its ability to provide a safe vehicle for communication and self-expression. I asked Dr. Deborah Teplow, CEO and co-founder of the Institute for Wellness Education (IWE) to explain how IWE incorporates Interactive Journaling® into its level I coaching certification training, Take Charge of Your Life: Be Well to Do Well. The course is online and supplemented with live teleconferences. We use My Personal Health Journal to enhance students’ ability to make positive, lasting change in their own wellness. Journaling corresponds to four (physical, nutritional, financial, and emotional wellness) of the ten units on wellness in the online component of the course. For each of the four units, students complete all the activities in the journal on their own and then participate in online discussions with other students about their journaling experience. The second way we use journaling is to train students to lead group journaling sessions. Students are trained through live skills practice and rehearsal (“real play”) during weekly teleconferences. Our graduates lead “Journal Clubs” using My Personal Health Journal and several titles from the “Keep It Direct and Simple” series in a variety of settings, including houses of worship, high schools, and public-health agencies. 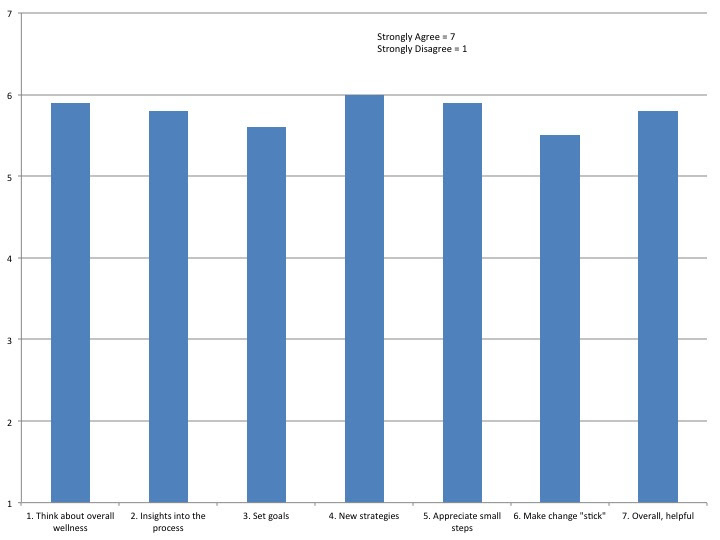 Please rate (1 = strongly disagree, 7 = strongly agree) the impact of journaling on your self-change process. On average, participants endorsed a level of agreement that favored the “strongly agree” side of the scale. Miller, W.R (2014). Interactive journaling as a clinical tool. Journal of Mental Health Counseling, 36,(1). A lot of people use an electronic calendar for their appointments and work schedule. Not me. 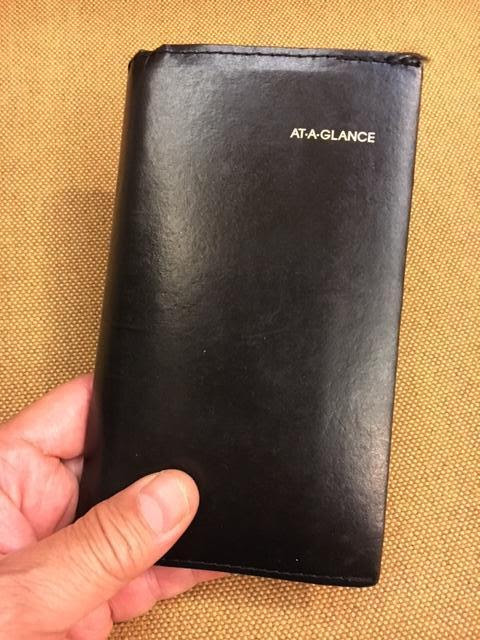 I have been buying the same AT-A-GLANCE ® Weekly Appointments planner for the last 30 years or more. There are real advantages to going digital and paperless, but I am just old-fashioned. When I am on the phone planning an appointment, I can keep talking while I grab my planner and leaf though the pages of weeks looking for an open spot. No need to place my cell phone on speaker mode while opening the digital calendar, swiping through the weeks to find a date and time. Just see-at-a-glance while talking. If I want to check back on what airport or airline I used for the same location six months ago or even last year; and which hotel I stayed at, all that is right on the page to see. I know I could copy and paste that information into the digital calendar too, but I think the time to do that is not much different; and I think, harder to retrieve quickly. When it comes to “To Do” lists, no Wunderlist or digital reminder apps for me. I have a page in my pocket paper planner to write on my “To Do” list as tasks arise. Then from that general list I make my daily list of things to do specifically that day. It is such a satisfying feeling to take my pen and scratch out each task as it is done. Inevitably, there are items on the list I didn’t get to and scratch off the list. 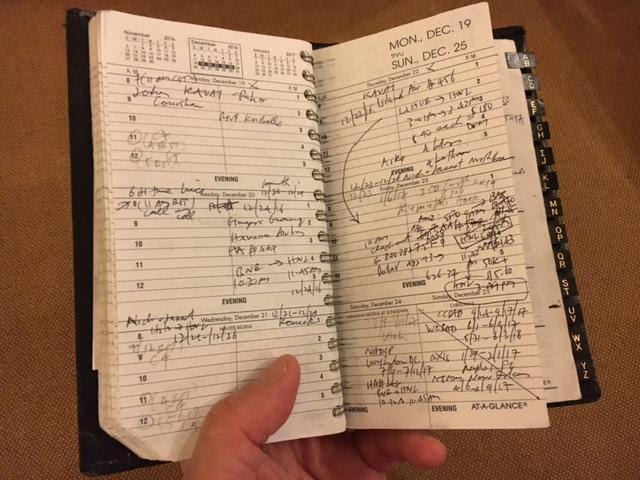 This is a visual reminder that once again, I was overambitious and over scheduled myself – sort of like a journal page to initiate a change process to slow down and smell the roses. This holiday season will you be putting pen or pencil to paper for all those personal holiday greeting cards? Or will you send out a general holiday newsletter by email to all your family and friends like we’ll be doing? Is that progress or have I just now succumbed to the impersonal, keyboarding digital age?